You need python-pygtk and glade to make it work. Just click on the desktop icon called "Mokometeo" to load the software. 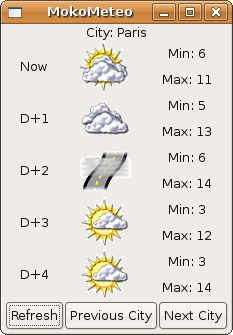 You will see a window appearing, with a 4 days forecast : Today, tomorrow (J+1), the day after (J+2) , etc. You can use the Next and Previous buttons to change the displayed city. Next time you starup Mokometeo, the last fetched data will be displayed.